The QBrand QBlog: Customers wanted: Dead or alive! Customers wanted: Dead or alive! Were you one of the 150,000 "community leaders" who were mailed - in an envelope marked "private and confidential" - an "exclusive invitation" to the opening of the Commonwealth Games from Games supremo Ron Walker himself? Of course, as was well covered in the media at the time, a very wide variety of Victorians received them, including my wife and her Pilates teacher, but not me (do I sound bitter? ), and at least 40 people who were no longer leading the community but rather some kind of heavenly choir. That's right, even dead people were being sought to liven up the Opening Ceremony. This was widely perceived as a desperate response by Ron and his team to low ticket sales - here's how The Age reported it. The term "community leaders" sounds like direct marketing (DM) industry code for high income earners, but there were plenty of pensioners... and, of course, not many people continue to earn income posthumously, notable exceptions being Elvis, John Lennon, etc. Now the Accor hotels group - owner of the Sofitel, Novotel, Mercure, Ibis and Formule 1 accommodation brands - has taken a leaf out of the Ron Walker marketing manual. My late father-in-law Ernie, who passed away early in 1998 (yep, that's more than 8 years ago) has just received an exciting mailing from the Accor Première Vacation Club, a "holiday ownership" scheme (the sort of thing that used to be called "timeshare") that is a joint venture between Accor and the property developer Becton. 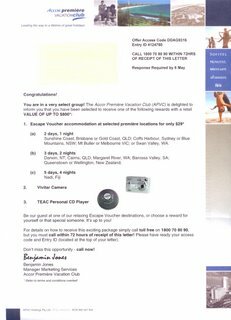 According to the letter from a Mr Benjamin Jones, Ernie is in a "very select group" and was "selected" to receive a "reward" with a retail value of up to $800, the only catch being (what, you didn't realise there would be one?) that he would be required to sit through a lengthy sales pitch (sorry, a 90-minute "holiday ownership preview") and doubtless be subjected to significant pressure to sign up or make some other commitment before taking up his "reward". So just how bad is Accor's mailing list? The "Frequently Asked Questions" section on the reverse of the letter says "You are one of the select few able to take part in this promotion. You have been chosen to receive this special offer based on certain demographics, past promotions or personal buying habits". The reality: Ernie has (of course) not travelled anywhere, bought anything, responded to a promotion or used a credit card in eight years, so the "selection" process certainly isn't based on any recent market activity or response. What about "demographics"? Well, if Ernie were still alive, he would be aged 81 - definitely not a prime candidate to invest in timeshare! 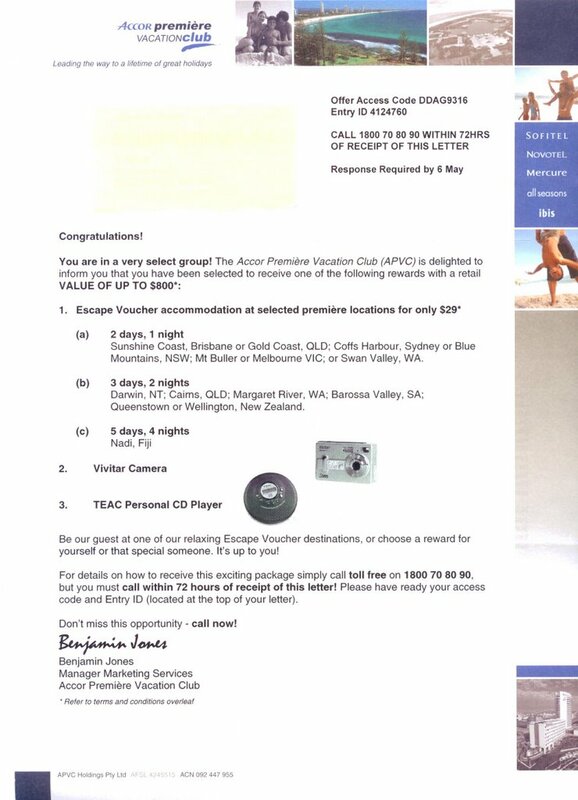 In fact, based on the way in which the letter was addressed, it is clear that the only way Accor's DM people specially "selected" Ernie to receive this "exciting package" is by using the White Pages. Yes, he's still in the phone book and that's where Accor has gone trawling. Receiving mail for a departed loved one can be distressing, but I prefer to look at it this way: next time I receive a personally addressed "special offer" and I'm tempted to feel flattered that some company has identified me as a highly desirable customer, instead I'll simply think fondly of Ernie, and smile as I am reminded (as if I needed to be) of just how abysmally poor so much direct marketing has become. By the way, while Accor is a French company, Becton is ASX-listed with Australian shareholders. If I owned Becton shares, I would be livid at this example of a marketing practice that is dumb, ham-fisted, "bottom-feeding" and wasteful, when I expect modern marketing strategies to be based on shareholder value. How much of Becton's potential profits and dividends are being used to send unsolicited, misleading and untruthful material to unqualified prospects with zero chance of response? In Heaven's name... not more hyperextension! ?